Are you bready for some morning deliciousness? Whether it’s smothered in chocolate sauce and ice cream (hellooo cavities), switched up and made savoury with plenty of bacon on the side, or a crazy but incredible mix of both, Brisbane cafés just love mixing it up when it comes to French toast. 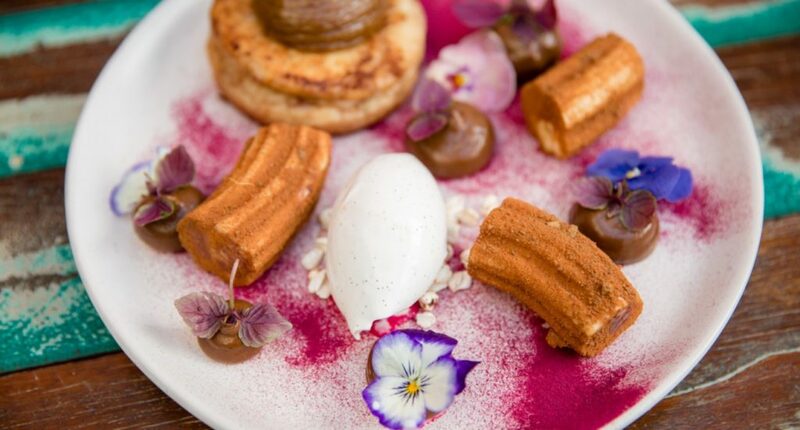 We’re not sure why it’s called French toast (it was invented before France was even a country for crying out loud), but we’ll happily eat more than a few servings of it – which is exactly what we did to hunt down Brisbane’s best. Your childhood just got an upgrade, thanks to fairy bread French toast (where was this when we were boujee 6-year-olds?). 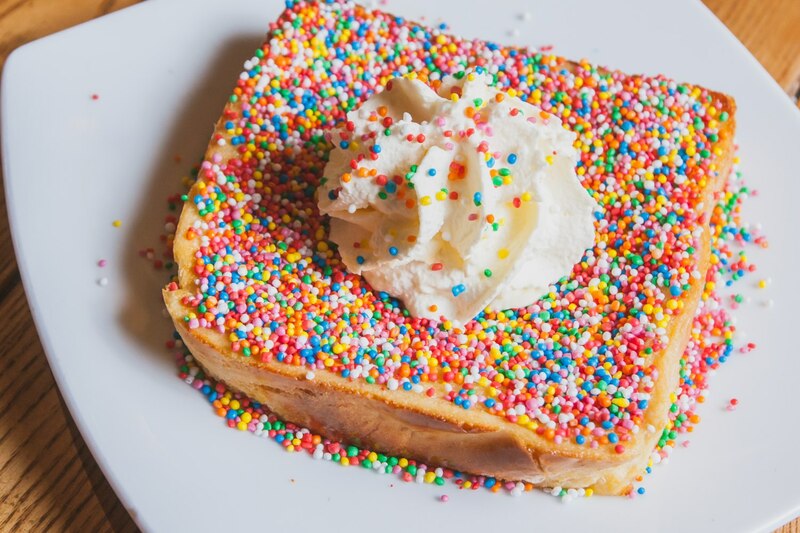 Cowch has managed to create the ultimate Aussie staple with a twist, coating your humble French toast with hundreds and thousands, and topping it all off with a big pump of whipped cream. Somewhere over the rainbow, you’ll find us drooling. They say that ignorance is bliss, but we think French toast is (and knowing exactly what’s in it is a good thing). This vegan (yes!!) puppy is put together with spiced Mexican chocolate mousse, banana churros, dulce de leche, coconut yoghurt and buckwheat puffs. Being healthy never tasted so good. Come on, it has coconut yoghurt. You can slam down a protein shake on your way to work if you like, but we’d much rather head to the city just a little early, and stop by Riverbar for their luscious French toast topped with strawberry, ricotta and pistachio. Too bad 8am is too early for a breakfast cocktail – but there’s always weekends, right? The harbour views are really just the icing on the proverbial cake, here. We’ll say this: the scenery and chilled-out vibe almost stack up against Northshore Harbour’s French toast. Almost. It’s pretty much impossible to beat pan-fried brioche topped with sweet sherry poached pear, cinnamon almonds and maple syrup though. We’re not really sure how French toast relates to Vietnamese, but we’re definitely not complaining about this menu item. With scrumptious toppings of vanilla-poached rhubarb, fresh strawberries, pistachios, greek yoghurt and honey syrup, this is one breakfast that will have you licking the plate clean. Mai o mai! Scream and Scout! A lot of places seem to believe that ice cream only belongs on pancakes, but not up in here friends. You can scoop up brioche French toast with strawberries, dark chocolate ganache, toasted almonds, ice cream and strawberry and limoncello syrup, because The Good Place exists in Petrie Terrace. Even though we’re all grown up, we still want sweet treats for breakfast damn it. Acclaimed vegan eatery, Grown, is powering your plant-based foodie dreams with brioche French toast, topped with seasonal fruit, housemade ice cream and caramel sauce. We’ll take an extra pump of caramel sauce, please. Round up the kids and promise them French toast, because Botero has bambino-sized bites. 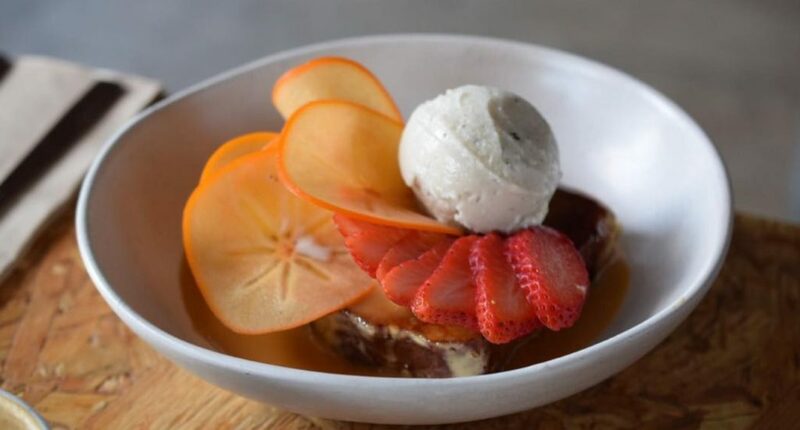 Treat them to mini French toast, maple syrup and ice cream, and get your big boy palate a plate of brioche French toast with stone fruit, coconut foam, and maple syrup. Fo’ shizzle my drizzle (I’m not a regular mum, I’m a cool mum). - the gourmands who are feeling pretty damn toasty in Brisbane heat.